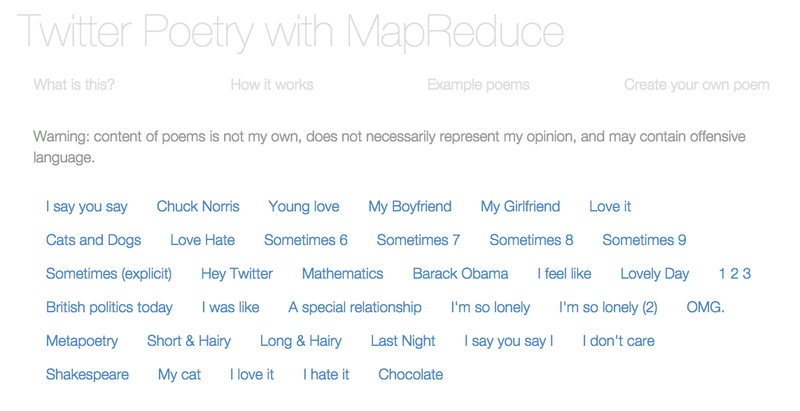 Following on from my previous post, I have now published some of my MapReduce-framework generated Twitter Poetry online! Click here to view. The poems are all created with data from around 10-24th November, where unrelated individual’s tweets are compiled around certain subjects to create ‘poetry’. The results are often quite good. The most difficult thing to do convincingly is the scansion, but for now, I’m going to leave the project as is. The user cannot currently generate their own poetry, but I would like to add this functionality in soon. It becomes all the more magical when you see new poetry generated on any subject you can think of! The last few days I have spent brushing up my MapReduce chops, and having a play with Apache Spark whilst I’m at it. Alongside this I’ve been having a lovely time exploring the beautiful surroundings of Dali, Yunnan, China – spectacular! (Key, Value) sent to multiple Reducers, where Key=tweet text, and Value=other information extracted, e.g. username, tweet date. The reducers apply a minimum date function to each Key, thus unique tweets are extracted (duplicates deleted), with the first tweet of that content being kept, and all subsequent duplicates tweeted later in time being discarded. This just ensures the first publisher of twitter content is hopefully recognised. Mappers use regex to extract the final word in the tweet, and look up this word in a rhyme dictionary built from http://www.chiark.greenend.org.uk/~tthurman/rhymes.txt). This provides a numerical code for each word in the dictionary, where rhyming words share the same numerical code. I have also written ‘near rhyme’ code (for my separate ‘RhymeTime’ project) though this is not included in this prototype yet. (Key, Value) is sent to Reducers, one per tweet. This time the Key=rhyme code, and the Value=tweet text, username, tweet date. The Reducers can then package all of the tweets by rhyme code, ready for the final level (where we will choose the rhyming couplets from this list of rhyming tweets). Note that the reducer can count the size of each rhyme group it collects – if there is only one unique ‘last word’ for each tweet in the rhyme group, we can discard the group at this point, as you wouldn’t want two consecutive lines in a poem using the same last word (technically these lines don’t rhyme, despite having the same rhyme code). Mappers need to select two lines from each rhyme group, each line in the couplet ending in a different word. Currently this is done randomly. However, it would be desirable within the mapper to try and link the lines chosen for the couplet by topic, or rhythm, or alliteration, etc. This is discussed below as something I plan to improve. (Key, Value) is sent to the Reducers. Currently the Key is just the rhyme code (ensuring the rhyming lines are consecutive on the final output). pepsi + anything = a complete meal. i want a pepsi… in a can. 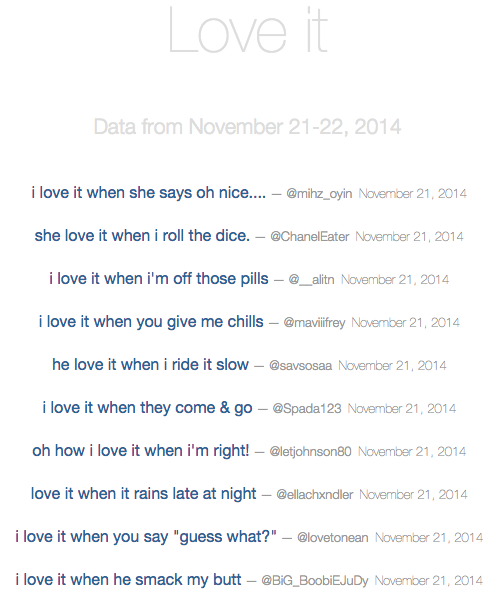 Considering the simplicity of what I’ve coded, it’s not bad, bar the inaneness of the tweets. More interesting keywords may improve things. I’ve also put through Alice in Wonderland, which works quite nicely! Technology-wise, I’ve coded each Map and each Reduce in Python, and am currently just testing on my local machine, piping the inputs and outputs between six Python scripts (see my Github). Once I can access a larger volume of tweets, I will attempt to run on a Hadoop cluster with streaming and these same Python scripts. The code can probably be optimised a little – I may not need to send usernames, dates or even tweet text around between each and every Hadoop stage, instead converting to a unique ID once required information has been extracted from the tweet, and just looking up usernames, dates and tweet text up for the few chosen tweets at the end. Adding a temporal aspect to things: we could attempt to ensure earlier tweets come earlier in the poem, and later tweets later in the poem. We could then produce a poem spanning Obama’s presidency for instance (filtering by tweets containing ‘Obama’) where the poem describes the presidency (and popular opinion) over time over the course of the poem. Creating a user interface to allow anyone to choose a topic and create a poem. As mentioned though, the main issue will be how to scrape tweets from Twitter fast enough (considering API rate limits) to create decent output, before a user gets bored! As ever, a lot of projects on the go right now, but definitely hoping to extend this fun one a little further.